Ghoul hunters can take a trip to Chester and enjoy a stay at the BEST WESTERN PREMIER Queen Hotel. Opened in 1860 it is said to be one of the most haunted hotels in the country. Thought to be a former nursery, the second floor of the hotel is now rumoured to be home to 'the giggling girl' who is reported to sneak up behind guests and playfully pull their hair while they run a bath. It is also said she can be heard giggling and peddling on her beloved tricycle along the corridor. Guests staying at the hotel on 31 October can add another dimension to their spookfest and enjoy a special Halloween evening which includes a three course meal, served with a blood-red glass of wine and a guided tour of the property for the chance to meet the giggling girl and other ghostly characters. The evening also includes an audience with psychic Eleanor Dayton. BEST WESTERN PREMIER Queen Hotel's Halloween package costs from £80 per person. 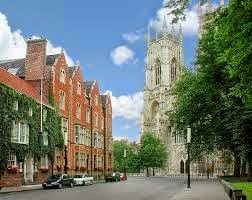 York is said to be one of the most haunted cities in the world with a rumoured 24 ghosts frequenting the city including the crying girl, the headless woman and the Grey Lady. BEST WESTERN PLUS Dean Court Hotel has its very own ghost – the mad maid. Mediums discovered the mad maid in the hotel's kitchen and she claims to be a former maid of a guesthouse which now forms part of the hotel. Room 36 on the third floor is also said to have a ghost in residence with reports of doors slamming, moving objects and cool spots even in the height of summer. Spooky stays at BEST WESTERN PLUS Dean Court Hotel start from £171 per room based on two people sharing and includes breakfast. Thinking of a romantic break for two and leaving behind the toddler tantrums and stroppy teenagers? Well think again. For couples staying at the BEST WESTERN Walworth Castle Hotel there are no promises that the stay won't be interrupted by the hotel's very own lovelorn teenager. This sad ghost has a real life tale of forbidden love to tell. The daughter of a lord, she fell in love with a stable boy, but was forbidden to see the object of her desire. The secret romance did not stay hidden for long and the teenagers were discovered and separated forever. Guests often report sightings of the love sick girl walking along the first floor which was once the corridor to the honeymoon suite. Guests have woken to tea cups rattling and chambermaids have had their hair tugged. An eerie stay at BEST WESTERN Walworth Court Hotel starts from £73 per room based on two people sharing and includes breakfast. For more information or to book visit www.bestwestern.co.uk or call 08445 73 73 73.